This apartment (first floor) is located in a typically Tuscan agriturismo in the area of Vinci. The agriturismo (6 different apartments in total) also offers a cosy garden with barbecue and a swimming pool, with a view of the hilly landscape. Vinci is, of course, also the birthplace of Leonardo da Vinci, so you can visit the house where he was born as well as the Leonardo Museum in the castle. The magical landscape is still like Leonardos paintings and is very much worthy of them. This holiday house is also perfectly situated for visiting the famed cities of Florence (Firenze), Pistoia, and Pisa or, a bit further away, Lucca and Siena and the area beyond. 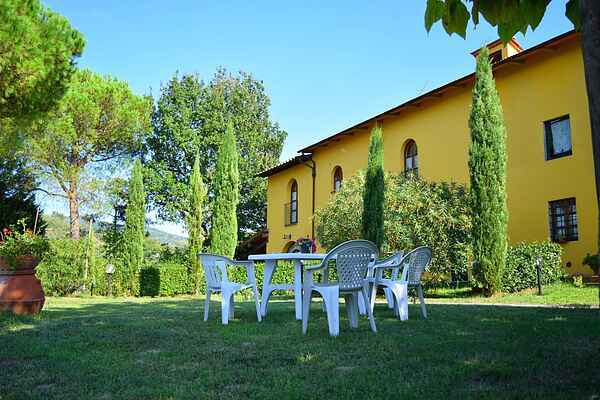 The Villa is located in Tuscany, in the native town of Leonardo da Vinci and surrounded by vineyards and olive trees. Our facilities includes 11 double bedrooms and 9 bathrooms, the building is divided in 7 independent appartments. The building includes a shared garden for the customers, swimming pool and a gazebo. The reception is open from 3:30pm to 7pm, and has a free Wi-Fi. The maximum capacity is 22-30 people.